Wikileaks released a trove of information today it calls Vault 7, part of a larger cache of information in its “Year Zero” series that seeks to inform the public of alleged government overreach. Included in the document dump is a fascinating guide for CIA agents stationed in Germany. Talk to CCIE/Engineering about your planned TDY timeline. Consider US/German holidays, current Base activities, USG shutdowns, world events, etc. CCIE can provide you with a list of hotels that you can choose from for your TDY. Try not to stray from this list; these hotels are pre-approved by Frankfurt Base. Write your own cable requesting TDY concurrence. Seriously, if you have never written a cable in your entire career, do it yourself. Learn to write a cable: believe it or not, it’s a handy skill. Learn/create your cover-for-action story. There will be a slight difference based on your own cover status. Talk to CCIE/Engineering. Have your Point-of-Contact information on your person. There will be a slight difference based on your own cover status. Talk to CCIE/Engineering. Have a travel credit card. You will need the PIN to get a cash advance. Advance and conversion fees are accountable on your TDYvoucher. Government Travel Cards work great for this (built-in accounting). You are allowed write checks for euros at the Consulate Cashier if you are in TDY status. So if you would rather get cash that way, remember your checkbook. If you are using a personal credit card, be sure to call your credit card company and notify them of your travel to Germany. Flying Lufthansa: Booze is free so enjoy (within reason)! Flying United: My condolences, but at least you are earning a United leg towards a status increase. Breeze through German Customs because you have your cover-for-action story down pat, and all they did was stamp your passport. Get a cab to your hotel from the airport. Check in, drop off your bags, shower (you probably need one). If you arrive on a Sunday morning… expect to find most businesses (grocery stores especially) are closed. Some restaurants may be open. Gas stations are not recommended for fine dining. If you arrive on a Monday morning… expect that they might not have a room ready for you at your hotel. 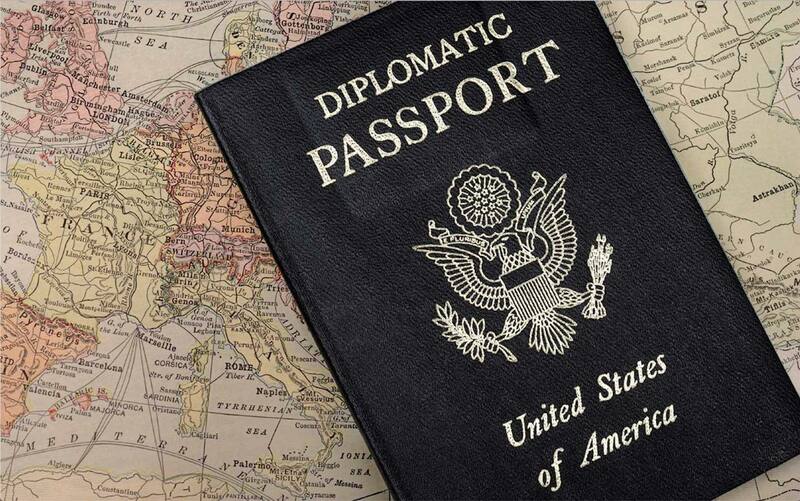 Get checked in, decompress, then head into the Consulate. Bring all personal or work electronic devices with you to the Consulate. There is a holding area outside of the SCIF for personal electronics. From the Gießener Straße stop, walk south towards the Consulate. Present your Black passport if that’s all you have, and you will get a yellow vistor’s badge. You can trade this for a blue visitor badge at Post 1. Present your white State ID if you have one. You will be buzzed right through the doors. Follow the signs for the “Employee Entrance”, walking alongside the Consulate building on the left side. Show your badge (yellow or white), and you will be buzzed into the Consulate. Follow the signs for Post 1. You will know you’re in the right place when a large heavy door closes behind you, and you realize you are trapped in a large room with a Marine behind a glass window. If you have a yellow badge, ask the Marine to give you a blue visitor badge. Use the phone at Post 1 to call your POC. You can just dial the last four numbers since it is the extension. Meet everyone at Base, including other TDYers. Talk to them and find out about what they do. Build that network! If you have never been overseas before (for work or at all), let folks know. Have a free weekend? Ask for advice on day trips and places to visit. Provide Base a briefing on newly delivered or burgeoning capabilities. You can prepare something ahead of time, or you can wait to see what needs Base has and present to those gaps. That being said, please no Death By Powerpoint! Be aware that your coworkers here are all under cover. While cover seems like an administrative thing back home, it is vital in the Field. Help protect everyone’s cover. Avoid using terms outside of the SCIF that could betray that people are not “State Department” employees. Better to keep work discussions at work. Respect that while efforts can be made to involve you in social activities, it may not always be possible because of cover concerns. Work with CCIE/Engineering to draft a TDY Wrap-up cable. Cable traffic or it didn’t happen. Leave with as few Euros in your pocket as possible. A fairly standard travel guide, but I got a kick out of the comparison of Lufthansa (“Booze is free so enjoy (within reason)!”) and United (“My condolences, but at least you are earning a United leg towards a status increase.”). Indeed, Sunday closing laws mean stores are shuttered on Sunday. The advice that a PIN is necessary for using credit cards is also sage. Now you know how to travel like a secret agent in Germany! Still, I’d think twice before asking for a blue badge if you ever find reason to visit the Frankfurt Consulate. Whoever wrote this CIA travel guide has a bit of a sense of humor/fun. That is not what I normally associate with CIA types.